Following up on the 21-Outrage, here is a look at a few more Outrages. First, there's Don McIntyre's beautifully restored 1973 21 Outrage. Then vintage photographs of a couple of original Outrage variants from the 1970's. 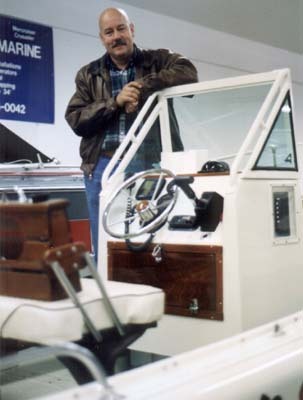 Don McIntrye's beautiful 1973 Boston Whaler 21-Outrage center console is an early example of the "new" 21-Outrage. The hull has smooth-sides, minus the ribs of the earlier models. The fuel system was upgraded to an integral tank in a hull cavity. Don bought this boat as a restoration project, but it turned out to be a bit more than he had initially thought. Some rotted wood in the transom required a complete rebuilt of that area, replacing all the internal wood. Don reworked the boat's interior to suit his needs, adding a new Reversible Pilot Seat and modifying the original console windshield. White Water Marine did the work. Don also raised the console several inches to better suit his 6-foot 4-inch frame. The hull and interior were repainted in Desert Tan hues using a polyurethane product by Sikkens. All the wiring in the boat was replaced and the electrical system upgraded, and all the fittings and hardware were re-chromed. The boat just looks stunning. A front platform creates a nice sleeping area in the bow, which can be made quite cozy by pulling up the new Forward Shelter Canvas, finished in a nice natural canvas tan color but made from Sunbrella fabric. For propulsion, Don just recently added 200 horses of Yamaha V-6 Saltwater Series power. You could say that he is pretty confident about the transom integrity now! I don't think you will find a faster 21-Outrage around. The next phase of tweaking will be a jack plate for the engine to experiment with higher mountings. This 28-year old Boston Whaler has received extensive restoration. Her transom was completely rebuilt to repair rotted wood. The hull interior and exterior were repainted with polyurethane. A Reversible Pilot Seat was added. All the wood elements have been finished with high gloss varnish. 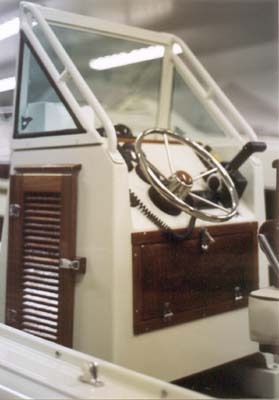 Note the raised Center Console. Don McIntyre reworked the original console, removing the windshield and railing and replacing it with a custom fabricated design of his own. 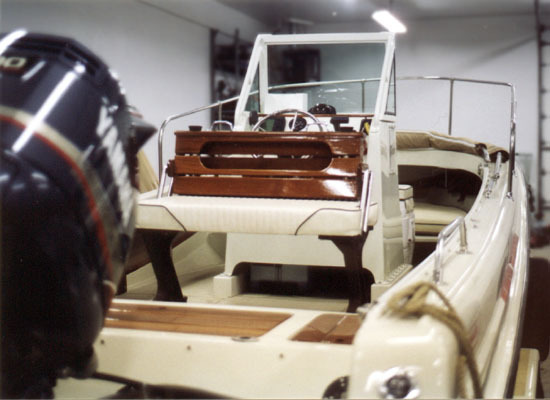 The classic Boston Whaler Reversible Pilot Seat has replaced the original seating in this center console. The teak is finished with many, many coats of varnish. Just visible is the new 200-HP Yamaha outboard. Speed and acceleration are amazing! Those big grab rails on the console will be appreciated at high speeds. More high-gloss varnished wood accents the console. [L to R] Walt's 25-Revenge, Walt Steffens, Jim Gibson, Don McIntrye, and Don's 21-Outrage at Port Huron, Michigan, October 2000. 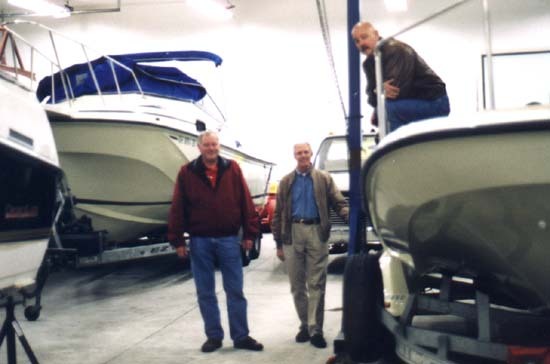 Whaler's in this condition deserve protection from the harsh Michigan winter with heated indoor storage. It also permits the owners to get some work done on the boats during the hard-water months of our northern boating season. 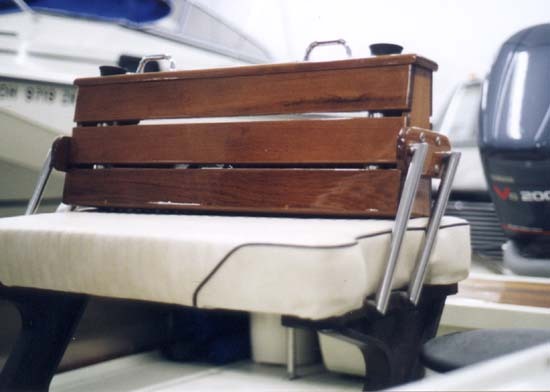 This photo shows a variant of the "banana curve" Outrage series where the upper hull/gunwale/deck mold was removed, creating a "Lo-Profile" model. It is essentially a 13-foot style Whaler stretched to 19-feet and with a center console. The Lo-Profile was marketed with advertising like this in 1976. 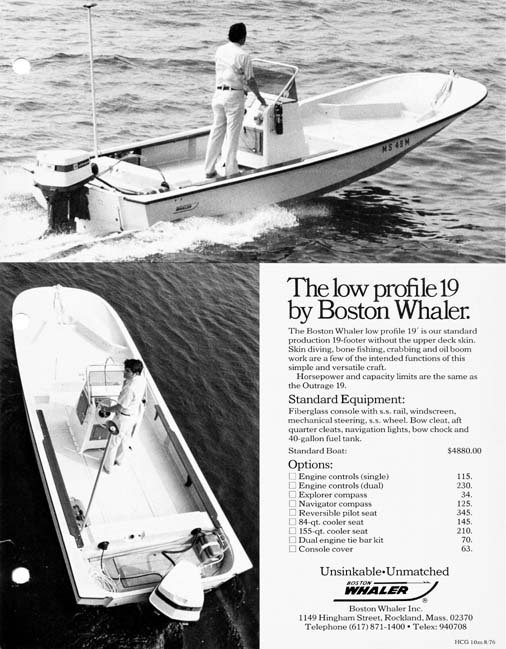 When the 21-Outrage was introduced in late 1970, it was the largest boat made by Boston Whaler, which previously had produced only 13-foot and 16-foot hulls. While the smaller boats had proven popular with commerical users, mainly as workboats, the 21-foot Outrage gave Boston Whaler a new commercial market into which they could sell. 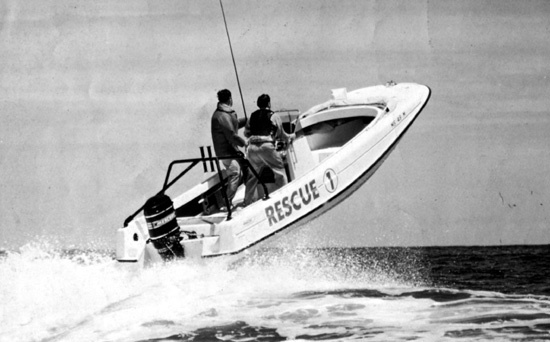 Its unsinkable nature and its big-water capability made the 21-Outrage a natural for use as a Rescue Boat. This would be Whaler's entrance into a market of commercial, government, and law enforcement customers that would become an important part of Whaler's overall operation. It began with the stock 21-Outrage, fitted with a few accessories. With 150 HP on the transom the 21-Outrage could hit 42 MPH. Negotiating big waves was not a problem, as seen here. Low freeboard facilitated rescue of someone in the water. Nothing else could combine speed, sea-handling, and safety like a Boston Whaler. 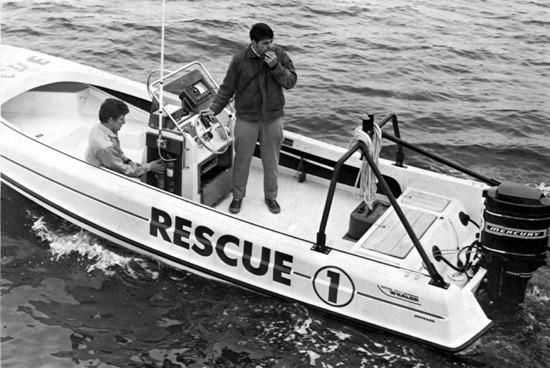 With the seaworthy 21-Outrage hull as a base, Whaler began to market to commercial customers, begining with this "Rescue Boat" version. The page has been accessed 69418 times.